If you are looking for the perfect Amana bottom freezer refrigerator for your needs then you’ve ended up in the right place. 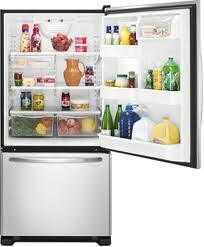 With most other brands you have an overabundance in choices but that is not the case with Amana refrigerators. It seems as if instead they’ve chosen to simplify the possible choices to make your job of finding the right one easier. They believe in the Good – Better – Best concept and have added into their refrigerator line. To make things even easier we’ve gone through and done reviews on the top three single door bottom freezer refrigerators that we feel are worth your taking a look at. Though if your are looking for an Amana double door/French door refrigerator, then click on the link below to see those reviews. Tip: We’ve found that taking the time to read all of the reviews can be quite helpful when deciding. Of course every model doesn’t work but by seeing what doesn’t work for you makes the right choice stand out. As we mentioned above, we are going to show you the good, better and best options of bottom freezer Amana refrigerators. We also found one more of our own choosing that we thought you might want to see. Take a look below to see all 4. OVERVIEW: This 18.5 cu. ft. Amana bottom freezer refrigerator falls into what Amana calls the “good” category. It is a great basic refrigerator that will take care of your needs without too many bells and whistles at a price you’ll be very comfortable with. 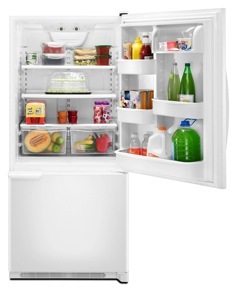 While it’s not flashy, if you are in the market for a bottom freezer refrigerator, it is a must see. Read the full review. OVERVIEW: This models falls into the “Better” category in Amana’s eyes and it’s easy to see why this model is definitely a step up. First of all this Amana Refrigerator only comes in many different finishes, including stainless steel. There are more storage organization possibilities and it also has a reversible door swing as well as which is perfect for any kitchen. The added features of produce and meat and cheese compartments allow your food to remain fresh even longer. What was so amazing about this fridge as well was the really great deals you can find it for. Go to the review to see what we are talking about. Read the full review. OVERVIEW: Now we’re talking “best” according to Amana. The first difference we found was the increased storage capacity at 21.9 cu. ft. as well as easy organizational features of crispers, deli drawer and a dairy compartment. The MSRP on this Amana bottom freezer refrigerator was quite good though once we did some research we found it even cheaper. Read the full review. OVERVIEW: While this model doesn’t fall into what Amana terms their good, better best, we still felt it was a model worth reviewing. It should fall more into the better category but it has the extra space of a best as it has 21.9 cu. ft. of storage space. 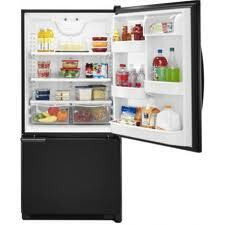 As for the price, it is quite comfortable for a mid-range bottom freezer refrigerator. Take a look for yourself. Read the full review. Amana French door Refrigerators: Now that you’ve seen the single door bottom freezers we really recommend that you take a look at the double door or French door versions. They add a great deal without a huge price difference. Amana Refrigerators: If you really want to get an Amana refrigerator but aren’t sure which style is right for your needs, then this page will show you every Amana option there is. Bottom Freezer Refrigerators: If you’re still certain about a single door bottom freezer refrigerator but not so much about the above choices from Amana, here’s a list of bottom freezer refrigerators from almost every brand on the market.